We’re a musical city: hip-hop has roots here, godfathers of jazz call the city home and some of the most beautiful anti-apartheid anthems were written by Capetonians. But did you know that we also contributed to Afro-pop and are behind “glitch opera”, “wave noir” and the “zef” movement? The all-female crew from the Cape Flats were the queens of South African hip-hop in the 2000s. Lyricists EJ Von Lyrik, Shame and Burni’s brand of hip-hop was conscious, highly political, defiant, and uplifting. This 'Mindz Ablaze' video from their 2004 album, Spillage, is a reminder of what a trailblazing trio they were. Cape Town’s Northern Suburbs were treated like the city’s unwanted stepchild until artists like Jack Parow came along. The Afrikaans rapper was born in Parow and raised in Durbanville. This hilarious 2010 video (views in the millions on Youtube) was shot outside Bellville’s drive-in Burger Fair. The song gives props to the kids of the Northern Suburbs. The opening chords are so instantly recognisable, the song is now a national treasure. The instrumental classic by the jazz legend Abdullah Ibrahim is named for the coloured township of the Cape, Manenberg. The upbeat tune was composed and recorded in 1974 in the area where the pianist was born – historic District Six. Members of this seven-piece band come from various parts of Southern African, but they were formed right in our backyard in 2002. ‘Doo Be Doo’, the feel-good anthem off their second album, Nomvula (2004), garnered national attention. Their folksy, Afro-fusion, pop and world-music style has gained them world recognition, but they remain a Cape Town band at heart. The glitch opera pioneers from Cape Town’s electronic underground scene banded together to form Lark at UCT in 2003. During their six-year reign there was nothing like them, largely due to frontwoman Inge Beckmann’s operatic vocals. This ‘Heroin Mary’ video proves why they became so cultish. Bright Blue was formed in Cape Town in the 80s, and this emotive song was recorded during that repressive time. Protest songs were banned during the period, but ‘Weeping’ spent two weeks at number one on local radio stations without censorship, despite the fact that you can hear the haunting humming of the then-ANC anthem ‘Nkosi Sikelel’ iAfrika’. The gravel-voiced songstress made an impact with this upbeat song in 2009, the first single off her debut album, Behind Closed Doors. You wouldn’t know from watching this video of a spunky Hays that it took the singer years before she revealed her talent. The Capetonian has released more albums since. Die Antwoord (Yol-andi Vi$$er and Ninja) formed here in 2008 and ‘Enter the Ninja’ (now at over 60 million views on Youtube) was the song that made them viral. The tune was just a taste of their punky, ravy and infectious brand of hip-hop and accompanying freaky, mind-bending music videos. Not to mention, it infected the world with the “zef” lifestyle embraced by some of Cape Town’s youth. In 1996 Vicky Sampson, who comes from Hanover Park, became the voice to inspire a nation. She belted out the song at the opening ceremony of the African Cup of Nations, which South Africa won, just two years after our first democratic election. The powerful ballad highlighted the positive climate of the day; it was the sweet note ushering in our “new tomorrow”. You can’t speak of hip-hop without saluting Prophets of Da City, the Cape Town conscious rap group founded in the 80s, when their politically charged lyrics were a fist against establishment. The jubilant and celebratory ‘Never Again’, released in 1994, applauds South Africa – “Excellent, finally a black President!” – specifically those individuals who fought against apartheid. It’s a poetic Afrikaans song by a legend that’s also a love letter to the city. Just listen to the lyrics “...The side of Table Mountain”, “…Cape Town in the night”, “…the depths of Orange Street”. Kombuis, who grew up in the Western Cape’s many small towns before moving to the city as a youngster, was an artist against the apartheid state in the 80s. This poignant classic off his 1990 album, Niemandsland and Beyond, has since been covered by others, including the Parlotones. This song, about the struggles of a young boy, is one of the most famous from musical legends David Kramer and Taliep Petersen’s District Six musical, a production that payed homage to the area from which people were forcibly removed in the 70s. When the show premiered in 1987 at The Baxter Theatre audiences of all races came to see it, and it graced the stage more than 550 times before final curtain call in 1990. When it returned to the Baxter in 2002 and 2003 it became the theatre’s longest-running show. When the Xhosa crooner from Gugulethu released ‘Sondela’ in 1997, shortly after he was declared Best Male Artist at the SAMAs. He’s been a mainstay in afro-pop ever since because his music is not just driven by the beat, but also his voice and the cultural Xhosa heritage, garb and rhythmic (ukuxhentsa) dancing that have become mainstays at his live performances. The credits read “DJ Clock featuring Beatenberg”, but we could argue that it should be the other way round. It’s the Cape Town-based trio’s unique voice that lifts this house track (DJ Clock is based in Johannesburg). This song of 2014 is also a showcase of our beautiful city: the beaches and neighbourhoods. And you’ll wonder: Is that Signal Hill, Chapman’s Peak and eatery Yours Truly? The Mother City is a cultural melting pot, and Congolese Petite Noir, who grew up in Belgium and whose family moved to Cape Town when he was three, is one of the outstanding bits in the mix. His smoky vocals and haunting beats are helping him carve out his own niche in a genre he calls “noir wave”. When he released ‘Till We Ghosts’ people noticed, among them Yasiin Bey (Mos Def), who features on his new EP, released in January 2015. They are frontrunners in the Bellville Rock City collective, the post-apartheid, angst-ridden bands of the northern suburbs who became a voice for white kids stifled by Afrikaans conservatism. ‘Hemel Op Platteland’ was one of the first singles released off their 2003 debut album, As Jy Met Vuur Speel Sal Jy Brand. It also became the first Afrikaans song to be playlisted on 5FM. She’s the jazz whizz from Stellenbosch with a soulful voice. Her melodies are poignant and heartfelt as displayed in ‘Hypnotized’, a track off her second album released in 2010; the same year she became winner of the Standard Bank Young Artist award for Jazz. The first time many heard of Dookoom was when they released their controversial ‘Larney Jou Poes’ at the end of 2014. But before that there was ‘Kak Stirvy’, another rap song with explicit lyrics and an equally arresting video. Dookoom is a ballsy hip-hop metal band fronted by Isaac Mutant, who you see ambling along in a “fur coat” in the Cape Flats area of Heinz Park and chanting, “I’m kak stirvy”, local slang for “stuck up”. Born and bred in Athlone, he’s one of the Mother City’s finest musical exports. He was singing and playing guitar by seven, and his songs, a blend of jazz and R&B, were one of the first to be played on white segregated radio stations, though he is coloured. ‘Lies’, his 1987 hit single, was Grammy-nominated. South Africa’s Queen of Pop, the Madonna of the Townships, MaBrrr was born right here, in Langa. She left the city for Johannesburg and became a musical icon. When she died, about 10,000 people attended her funeral at Langa Stadium. ‘Black President’ is her song about another local icon, who was sent to prison a year after she was born. This 25-year- old rapper, with lyrical skills well beyond his years, combines the unique dialect of Cape Town with his own soulful experiences in his track “SALUTAS” (or, salute us). To be saluted is a sign of respect, something that Youngsta commands through his music. No more hype is needed, just watch and listen. 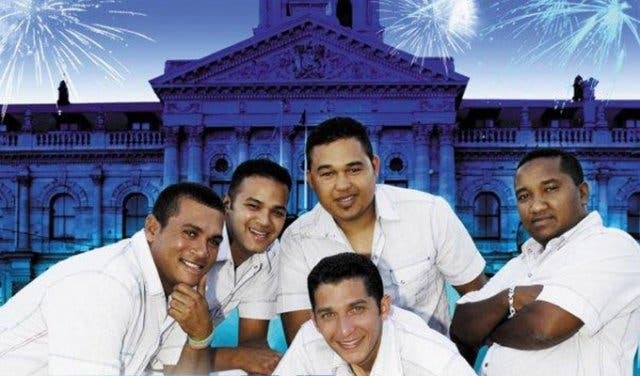 This boy band or lets say man band today is one of Cape Towns longest standing musical groups to date, the lead singer Rashaad Voegt being the original "broertjie" of District Six the musical. Stay The Night hit the charts and stayed number one for a number of weeks and is still one of the Mother City's most memoroable jams to hit our streets. The late and maganificent Zayne Adams is no doubt one of South Africa's musical legends, when Give A Little Love hit the charts in 1970's, The Pacific Express and Zayne Adams blew the country away with this smooth ballade and it's success chanllenge the apartheid laws at the time. It still stands tall today as part of his amazing musical legacy. Also find out how you can enter the MTV Base VJ Search auditions in Cape Town.